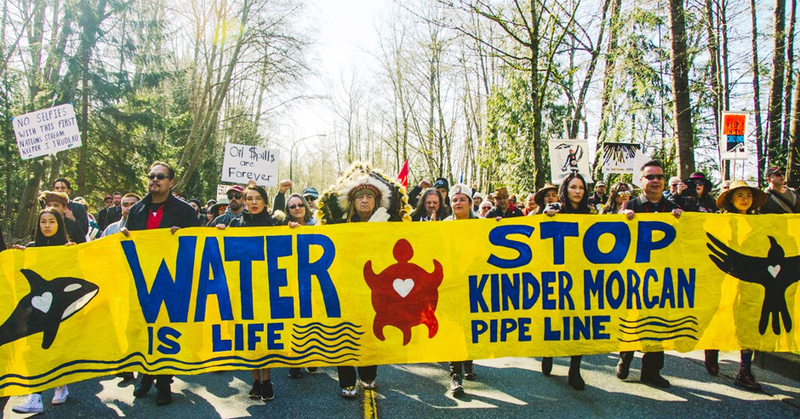 The federal Liberal government’s $4.5 billion purchase of the TransMountain pipeline expansion project is a bonanza for Kinder Morgan shareholders, but a disaster for Indigenous peoples, the environment, and communities along the pipeline route. The Communist Party of Canada calls on Parliament to reject this dangerous sellout, and instead to move away from reliance on extraction and export of raw materials, towards energy and resource policies that protect the interests of people and the environment, and respect Canada’s commitments to the United Nations Declaration on the Rights of Indigenous Peoples (UNDRIP) and the Paris Agreement. PM Trudeau set the stage for Kinder Morgan’s blackmail tactics, when he immediately surrendered to the US-based corporation’s demand for guarantees of compensation in the face of massive opposition from First Nations and environmental groups, and the BC government’s legal challenge. But as the Protect the Inlet coalition and other opponents made clear after the deal was announced on May 28, the answer to the pipeline expansion is still “NO”. This project poses a terrible danger to the fragile eco-systems of the west coast in the event of any significant leak or tanker spill. It was approved after a review process rigged to meet the demands of Kinder Morgan, and it lacks the consent of impacted communities along its route. Hundreds of people have already been arrested for opposing the pipeline and defending the water, land, and climate, and tens of thousands more have declared their intention to mount even stronger resistance. In this context, the Liberal government’s $4.5 billion dollar purchase is an abuse of political power, and a shocking misuse of public funds. Even Kinder Morgan’s shareholders believe the project is too risky to proceed, and no other private investors are likely to appear before the government’s July 22 deadline, because it does not make business sense. The federal government paid $4.5 billion for the existing Trans Mountain pipeline, and the work already done on the expansion to triple its capacity. Kinder Morgan Canada’s 2017 annual report values all its pipeline assets at $1.3 billion (including the Anacortes pipeline that carries oil from Abbotsford to refineries in Washington state, and the Cochin pipeline that takes condensate from North Dakota to Alberta); the actual asset value of TransMountain is about $670 million. This purchase includes the value of work done so far on the expansion, about $930 million by the end of 2017. In other words, the government is paying $4.5 billion for $1.6 billion in assets, and gets to run the pipeline and take the profits. TransMountain’s share of KM’s 2017 earnings was $118 million, for a 2.6-per-cent return on this investment in an aging asset. The expansion is projected to take another $6.4 billion, pushing the cost of the deal over $11 billion, a figure which will rise as work begins. The initial cost is about $180 for every taxpayer in Canada. If the project is ever finished, which is unlikely, that will cost each taxpayer another $250. Looking at these cold, hard figures, the conclusion is obvious. This is not the case of a government buying a valuable public asset. It’s a political deal to satisfy the demands of Big Oil, and to allow the federal and Alberta governments to claim that they are “growing the economy.” Pro-corporate politicians and pundits argue that the purchase will pay off by boosting KM share values, a highly exaggerated claim at best, based on unfounded guesses about future oil price increases. The Communist Party of Canada condemns the Trudeau government’s latest giveaway to the big energy monopolies. The federal government must stand down, and take meaningful steps towards truly respecting Indigenous Title and Rights. We call for a People’s Energy Plan, including public ownership and democratic control of all energy and natural resource extraction, production and distribution. We say: no to the TM expansion and other pipeline projects; freeze and reduce energy exports; and expand shared power flows among provinces through an East-West power and energy grid. Block new development of the Alberta tar sands, close these operations within five years, compensate Indigenous peoples and communities; and guarantee jobs for tarsands workers in more sustainable industries at equivalent wages. Canada today is at a crossroads. The needs of Indigenous peoples, working people, and the environment must be given priority, not the private profits of Big Oil and other resource monopolies.